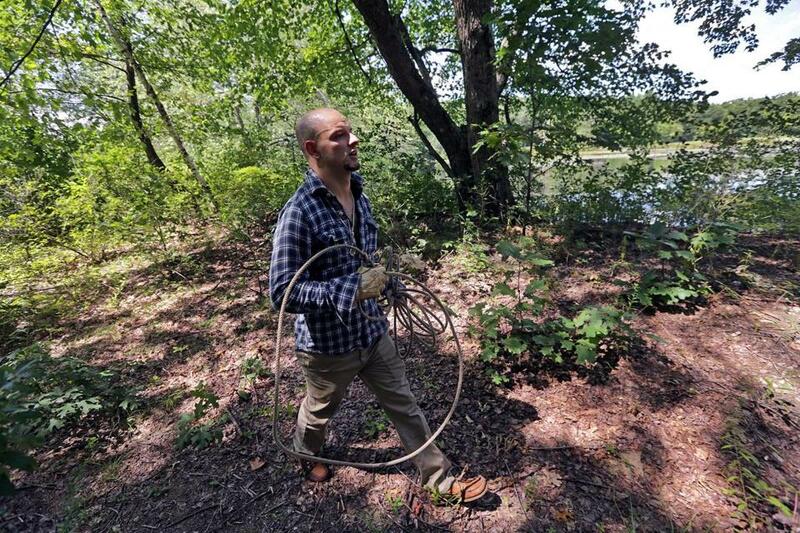 Corey Roy with New England Rodeo searched the woods on Thursday in Ayer for the elusive bull. The bull that escaped from a livestock auction in Littleton remains at large and is apparently roaming in the Ayer area, leaving many to wonder when — or if — it will ever be caught. The bull appears to be staying out of sight and avoiding people, as no sightings were reported to the Ayer Police Department Friday morning, officials said. The runaway bull has become a hot topic of conversation among residents and a growing source of concern for animal rights activists who want to save the bull from being slaughtered. Two nonprofit shelters — one in New York and the other in New Jersey — have offered to take in the bull if it’s captured alive. The bull, which weighs more than 1,000 pounds, was last seen Thursday in the area between Copeland Drive and Snake Hill Road in Ayer. The bull that escaped from a livestock auction in Littleton has now become a social media star. The bull’s owner, Terry Den Besten, has been searching for the bull since it escaped Tuesday, but with little success. The elusive animal remained at large in Ayer all day Thursday, and as of Friday morning it had still not been caught. Two nonprofits — Farm Sanctuary, which operates a shelter for farm animals in Watkins Glen, N.Y., and Skylands Animal Sanctuary & Rescue in New Jersey — have offered to transport and care for the bull once it’s caught. Whether the owner will agree to that remains to be seen. Susie Coston, the national shelter director for Farm Sanctuary, hopes the situation will be resolved before anything bad happens, and doesn’t want to see the bull shot and killed. She thinks the only way to capture the bull alive (and safely) will be to use tranquilizer. But if the bull is tranquilized, its meat can’t be used. Coston said Farm Sanctuary has taken in many escapees over the years. Just last year they received a bull named Frank, who made headlines after getting loose in Queens, N.Y. and ending up getting escorted to the shelter by comedian Jon Stewart. As each day goes by, the fugitive bull from Littleton has been gaining more attention. Ingrid Newkirk, the president of People for the Ethical Treatment of Animals, recently issued a public statement about the fate of the bull. Coston said she hopes that the bull will be allowed to retire to either shelter, where it can live out a “full, happy life” with the rest of the herd. Where should I explore tomorrow, my humans?